Be the first to share your favorite memory, photo or story of Albert. This memorial page is dedicated for family, friends and future generations to celebrate the life of their loved one. 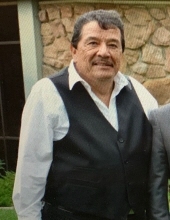 Albert Marquez, 65, of Denver Colorado succumbed to illness at the comfort of his own home on March 13, 2019. Proceeded in death by parents, Jesus Marquez and Grace Jaramillo Marquez. Albert is survived by his three sons, Gerard, Corey, Chris, his daughter Colleen, brother Jesse Jr. Marquez, sisters, Mary Francis Luna, Mary Lillian Marquez, Mary Ann Marquez, Sophie Crespin, and Phyllis Clark, and many loving grandchildren, nieces, nephews, and extended family. Albert was a loving father, grandfather, uncle, brother, and friend to everyone. Albert loved fishing, sports, especially football, which his favorite team was the Denver Broncos. He worked as a Plumber & a Maintenance Technician for the City & County of Denver for 30 years where he retired from. He spent his free time watching various sports games on TV and was in ROTC in high school where he took State in Drill Teams. He loved music, especially Santana; and played the trombone in school. He enjoyed movies and reading during the off-season. Albert was always there to help relatives and friends. To send flowers or a remembrance gift to the family of Albert Marquez, please visit our Tribute Store. "Email Address" would like to share the life celebration of Albert Marquez. Click on the "link" to go to share a favorite memory or leave a condolence message for the family.